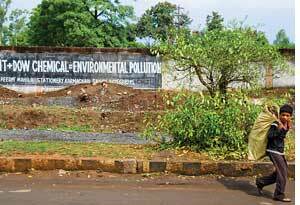 The Centre for Science and Environment’s Pollution Monitoring Lab (PML) tested water and soil samples from in and around the Union Carbide India Limited (UCIL) factory for the presence of toxic chemicals. The PML studied the chemistry of the processes used for producing various pesticides in the UCIL and based on it, selected four groups of chemicals for testing soil and water samples. In chlorinated benzene compounds it tested 1,2 dichlorobenzene, 1,3 dichlorobenzene, 1,4 dichlorobenzene and 1,2,3 trichlorobenzene. In organochlorine pesticides it tested alpha, beta, gamma and delta hexachlorocyclohexane (hch). The two main products of the UCIL, Carbaryl and Aldicarb, were also tested. Five heavy metals: lead, cadmium, chromium, mercury and arsenic were also tested. The UCIL used to manufacture three different kinds of pesticides Carbaryl (trade name Sevin), Aldicarb (trade name Temik), and a formulation of Carbaryl and gamma-hexachlorocyclohexane (g-hch) sold under the trade name Sevidol. g- hch was extracted from the technical grade hch, a mix of several chemical forms (isomers) of hch (mainly alpha, beta, delta and gamma hch). ucil used to buy technical grade hch, extract g-hch and throw the remaining isomers as waste. Carbaryl and Aldicarb fall under carbamate group of insecticides; both are moderately persistent, highly toxic; highly water soluble and mobile in soils. It is therefore not surprising that pml found both these pesticides in the soil and water in and around the factory. HCH and its isomers are highly persistent and toxic organochlorine pesticides and presence of different isomers of hch is because of its processing in the plant, use of g-hch for Sevidol formulation and dumping of other isomers within the factory and outside in the waste dump site (also called by the UCIL as solar evaporation pond). Hexachlorobenzene (hcb) is an impurity in the technical grade hch and was also produced as a byproduct of various chemical processes in the ucil factory. Chlorinated benzene compounds are highly persistent and were either used by ucil as solvents or are degradation products of hch or hcb. For instance, 1,2 dichlorobenzene was used as solvent for producing alpha-naphthola chemical used in the production of Sevin, the main product of ucil. Chlorinated benzene compounds are also used as insecticides and fungicides. Heavy metal like mercury was used as a sealant in the Sevin plant and chromium was used as a coolant in the cooling plant of the ucil factory. Scientists from PML visited Bhopal on October 28-29, 2009 to collect soil and water samples. One sample from the waste stored in the waste storage shed in UCIL. This is the waste that the government is trying to send to hazardous waste disposal site. Six soil samples were collected from various places inside the UCIL factory. The last soil sample was collected from the solar evaporation pondplace where UCIL used to dump all its wastes. Eleven water samplesfrom handpump, borewell and dugwellfrom areas around the UCIL factory. The samples were collected from colonies next to the factory boundary wall to those 3.5 km away from the factory. The results of the testing of one stored waste sample, six soil samples and one surface water sample in the factory and one soil sample from the waste disposal site (solar evaporation pond) clearly show that the land within the ucil factory and the waste disposal site is highly contaminated with pesticides, organic compounds and heavy metals. 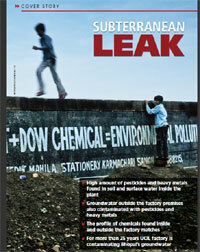 The waste stored within the UCIL premises had all four chlorinated benzene compounds and 6 out of the 7 pesticides. Carbaryl content in this sample was as high as 9856 ppm. The sample also had 4 out of the 5 heavy metals. Mercury content was 1065 ppm. HCH and its isomers, hcb, 1,3 dichlorobenzene and 1,4 dichlorobenzene were detected in all soil samples. In five soil samples 1,2 dichlorobenzene and 1,2,3 trichlorobenzene were found. Aldicarb was found in three soil samples and Carbaryl in one. The total pesticide and chlorinated benzene compounds content in the samples ranged from 185 ppm (in a pond near the boundary wall at Atal Ayub Nagar side) to 5874 ppm (from Sevidol formulation plant). The gamma-hch (Lindane) content in the soil sample from the Sevidol formulation plant was 2782 ppm. Arsenic and chromium were found in all soil samples. Mercury was found in two samples and lead in five out of the six samples. Chromium was found in the range of 18 ppm-298 ppm, the highest concentration near Temik plant. Mercury was found in two samples and concentrations were very high. In the soil sample collected from the floor of the Sevin plant, the concentration was 8188 ppm. Even now elemental mercury can be seen inside the Sevin plant. The surface water sample collected within the factory premises had the highest level of contamination and all compounds tested for were found. The soil sample contained all chlorinated benzene compounds and organochlorine pesticides. It also had four out of five heavy metals. Chromium content in this sample was 1065 ppm. ucil was using the chromium as coolant and was throwing cooling water in the solar evaporation pond. All 11 groundwater samples collected from colonies around the UCIL factory were contaminated with chlorinated benzene compounds and organochlorine pesticides. Carbamates were found in four groundwater samples. Concentration of pesticides found in all water samples was 1.1 to 38.6 times higher than the only mandatory Indian water standard, fixed by the Bureau of Indian Standards (IS:14543). The average concentration in all groundwater samples was 0.006 ppm which is 12 times the standard. 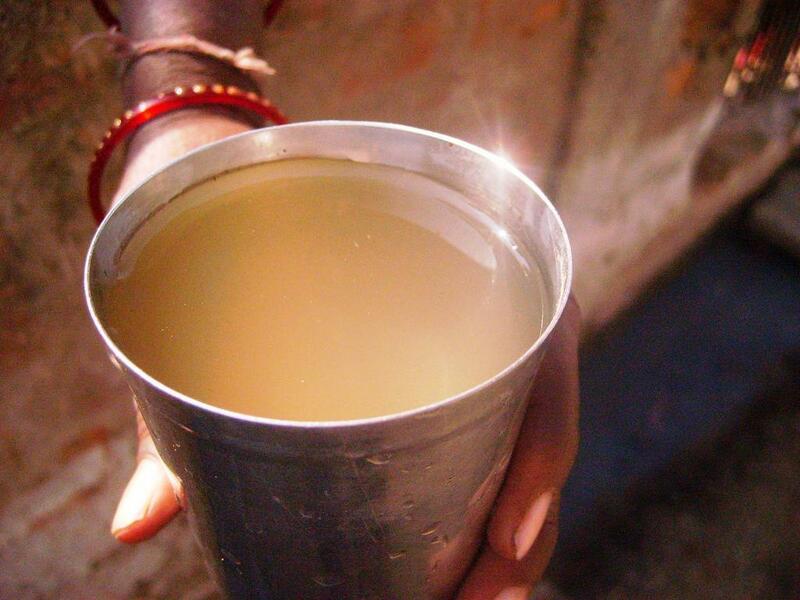 The water sample from a hand pump near the Chaurasia Samaj Mandir in Shiv Nagar was the most contaminated. It has highest concentration of Carbaryl (0.011 ppm or 110 times the standard), Lindane (0.004 ppm; 40 times the standard) and mercury (0.024 ppm; 24 times the standard). This place is more than 3 km from the UCIL factory. 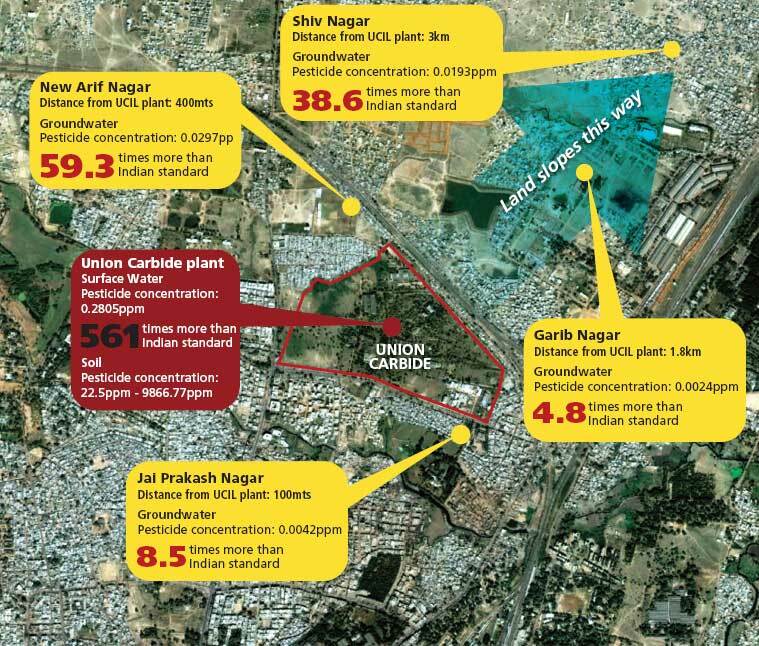 The profile of chemicals found within the UCIL factory and in the waste disposal site of UCIL matches the chemicals found in the groundwater sample in the colonies outside the factory premises. 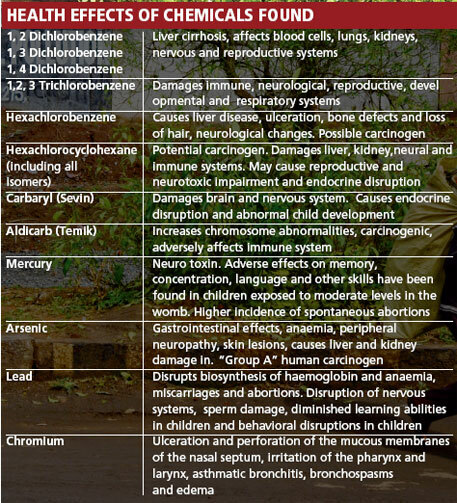 There is no other source of these chlorinated benzene compounds and pesticides than UCIL. The topography of the area also points towards contamination of the groundwater due to the UCIL. The plant is located at a slightly higher altitude than the residential colonies with a gently sloping terrain. Carbamates, as a general group, are considered to be moderately-persistent in the environment. But finding carbamates in groundwater, 25 years since the plant shut down, clearly means that the UCIL plant is acting as a continuous source of groundwater contamination. 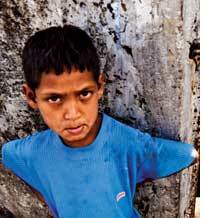 For more than 25 years the residents of the area have been exposed to chemical-laced groundwater. And, they will continue to be exposed till the site remains contaminated. What is also clear from this result is that the entire site is highly contaminated. The waste stored within the factory premises is just a small part of the total contamination present in the site. 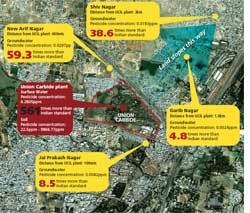 The focus of the government to just dispose of the stored waste and ignore the site contamination problem is not going to solve the environment problems emanating from the UCIL factory. PML, an independent lab with ISO 9001 accreditation, followed internationally-accepted US Environment Protection Agency (EPA) methodology. High Performance Liquid Chromatograph (Method 8318) was used to detect presence of carbamates (carbaryl and aldicarb). Gas Chromatograph was used to test presence of organochlorine pesticides and chlorinated benzene compounds (EPA Method 8081B). Presence of pesticides was further confirmed using Gas Chromatograph-Mass Spectrometer (EPA Method 8270 C). To check presence of lead and chromium, analysis was performed in Atomic Absorption Spectrometer (AAS) using flame technique. Similarly, presence of arsenic and mercury were established through analysis using AAS-vapour technique. For the analysis of both soil and water for these heavy metals EPA methods were used.